Facebook officially allows you to schedule your status update posts into your Facebook business page only. You cannot schedule your posts from your personal timeline and groups you are the admin. There could be some reasons for Facebook, or you can say spamming that triggered to Facebook not allowing scheduled posts for profile. Posting the same thing on pages, groups and personal profiles are most time consuming. If you are a Blogger like me, you might also feel like that. There are many third party services which allow you to schedule your posts for your personal profile timeline. Therefore, I am considering here a best one to schedule your Facebook posts to profile timeline. You can also schedule your status updates to Twitter tweets, LinkedIn profile or page and Google+ page by this third party site that I am going to share with you. If you want to schedule your posts into your Facebook page then you don't need to use any third party website as Facebook officially supports it. 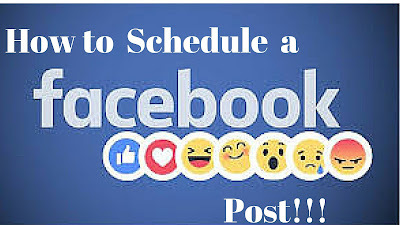 Here is an official documentation to schedule your posts to Facebook page. Now, looking forward to scheduling posts in profile timeline and groups. Go to postcron, and sign in using Facebook or Google+ or Twitter. Once you click on any social network, it will ask your permission to allow postcorn. You have to permit it. If you are choosing Facebook, it will ask the permission as well as the visibility of your post posted by postcorn so you may change the visibility from 'friends' to 'public' otherwise your scheduled post would not be view by everyone. You can also set the time as your local time either in the starting or going to the settings. Once you're in the dashboard, you can add your Facebook, Twitter, Google+ and LinkedIn profile. Click on the social profiles, and add the social accounts you want to scheduled post. Therefore, if you want to schedule your post from your personal profile timeline, you can choose 'Add Profile'. Once you click on any social account, allows it, and click on your social profile before clicking on 'I'm ready, go back to the Dashboard'. Once you added your social profiles, you can choose your social profiles to scheduled your posts. You can select or de-select your social profiles by simply clicking on them to share your posts. Write your status update and use other tabs to include images and the link you want to include into your posts. You have three option here schedule, Post now and schedule in your predefined publishing times. Post now will post your status immediately, and Schedule will schedule your posts while I will discuss more about schedule in your predefined publishing times later in this post. Once your post is ready, click on schedule. Now, set the date, time in hours and minutes. Scroll down the page to see your scheduled post are ready to get publish on your selected social profiles. Look under 'Review your schedule posts' you can view your schedule post. If you don't see the click on the social profile from the right side in which you have selected to publish that post. You can disapprove your scheduled post anytime by clicking on the green tick icon or delete it by clicking on the cross icon. You have successfully scheduled your first post. Now, let's talk about more features postcron provided to you. The number 1 advantage, it is free! If you don't have small business, you don't need to have its paid version. You can add up to 15 social accounts for free. If you want to add more social accounts to be connected here, you may go with the paid version. You can add up to 10 scheduled posts, but once they have published you can create more. Paid version has some more features like watermark on your images, unlimited scheduling and bulk uploading of your posts via .csv file. 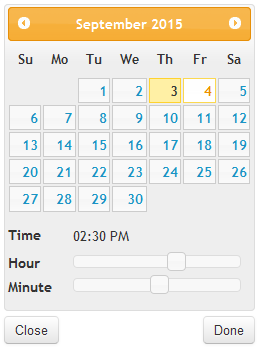 Schedule in your predefined publishing time: This is one of the most beautiful features provided by postcron. Let's you are regularly scheduled 10 posts to Twitter, Facebook and other social profiles then you have to set the time and date each time you scheduled the post, but using this feature you can save your time. You can set the date and time for each day of the week for each of your social profiles. Let's take an example that describes this feature more briefly. Let's suppose you are scheduling 2 posts on Monday in Twitter then you can set 2 times for Monday i.e., 18:30, 19:30 under Twitter from this option and clicked 'Apply list'. Then the first one will publish on 18:30 and the other one will be published on 19:30. Similarly you can define 3 times for the same day if you wish to schedule your posts 3 times in a day for your social profiles. Go to settings, click on 'Setup your Predefined Publishing Times', and set your time. Don't forget to click on 'Apply the List'. You can also connect your bit.ly account in each social profile to track the performance of your links in different social profiles. Here is a FAQ's page of postcron in case you have any question. You can also add team members so that they can manage your scheduled posts. It is a paid version only. Conclusion: I am so much impressed with feature postcorn provided with their users for free! Obviously, it is one of the best sites to schedule your posts for your social profiles. Postcron also allows you to schedule your posts for Facebook profile, pages, groups, events, Google+ page, LinkedIn profile, LinkedIn page and Twitter. If you enjoy this site, let's spread it with your connections. 0 Response to "How To Schedule Facebook Posts to Profile Timeline, Groups & Pages Using Postcron.com"